AllegroMedical.com presents The Compair Compressor Nebulizer System offered from Omron Healthcare Inc. The CompA.I.R NE-C801 is a compressor nebulizer with a lightweight (approx. 270 g) and handy design, with a sound level of 46 dB, the CompA.I.R NE-C801 allows for a very quiet and comfortable operation, CompA.I.R. 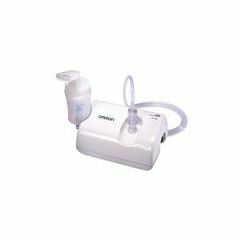 nebulizer kit also features OMRON’s Virtual Valve Technology. Product is great. Exactly what I ordered. Processing and shipping were quick. Prices are a little steep on certain items but comparison to other sites its around the same (give or take a few dollars). Shipping is outrageous. My product weighed not even a pound but was put in a huge shipping box which cost me almost $8.00. I do not mind paying s&amp;h but I think other options should be offered. Especially for small items. I ordered a product for my dad online and I expected it to take at least a week for the product to arrive...imagine my surprise and pleasure when the product was delivered the next day after it was ordered. Thanks AllegroMedical, you rock!!!! I have ordered twice from this company and I have been very happy with my products and customer service. I will continue to order my medical supplies from allegro medical.